Christine is most notably a cosplayer and a gamer, all while maintaining her day job as a chemist. She has been playing video games since she was very young, as well as being introduced to pinball when she was 11. She began designing costumes in 2011, though she didn’t realize there was a name for this hobby until years later. 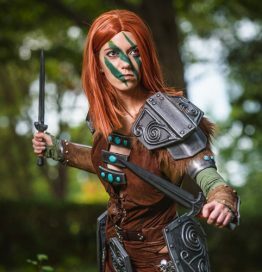 She coined her cosplaying name “Kanína” on Facebook, after her costumes grew in popularity, as well as winning her first costume contest in 2015. Most of her work is from video games, including Assassin’s Creed, Mass Effect, Metroid/Super Smash Bros, and even Pacman, which she made specifically for the Southern-Fried Gameroom Expo in 2015.